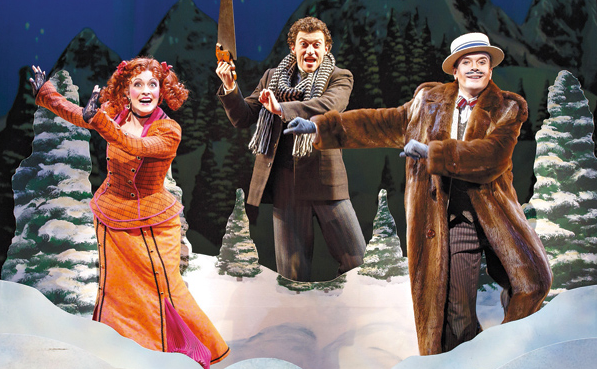 REVIEW: A Gentleman’s Guide to Love and Murder | Lord...What's My Motivation? *NOTE: These are merely thoughts by a theatre lover, not necessarily a theatre critic. The perfect poison? Add three ounces of THE DROWSY CHAPERONE’S style/grace and two dashes of Andrew Lloyd Webber’s BY JEEVES…shake rigorously until laughing and then add dynamic character actor Jefferson Mays and a whirlwind of costume changes, cheeky sight gags and a story that could be a castaway from a “write your own British murder mystery” contest…and you have one of the most entertaining musicals in a long time: A GENTLEMAN’S GUIDE TO LOVE AND MURDER. And it’s potent. It’s sad that so many musicals are considered “unknown.” Take gems like 25TH ANNUAL PUTNAM COUNTY SPELLING BEE or the wickedly clever play THE EXPLORER’S CLUB at the Manhattan Theatre Club, that are both very successful and yet aren’t considered proverbial powerhouses in their own right. Shame. It’s 1909 and we find Lord Montague D’Ysquith Navarro, (a wide-eyed and perfected Bryce Pinkham, who is romantic, perky, and a right stinker! Wonderful portrayal) in prison writing his memoirs, a confession really about the murders he’s recently committed, eight in fact, all his relatives and heirs to become the next Earl of Highhurst. The stage upon a stage (a clever and altogether beautiful esthetic, I took notes for future reference….the devil is in the details!) then unmasks his flashback to when he first discovered his life’s turn-around point at the death of his mother. His D’Ysquith bloodline will surely advance his social and financial status enough to capture the heart of Miss Sibella Halward, surely. But, as so many musical comedies flesh out, we find a torrid journey ahead of us and a twisted plot as Navarro executes a plan to one-by-one eliminate the descendants, some by “accident” and some with cunning villainy. All with many laughs. Of course we flesh out a love triangle, and throughout we meet a menagerie of colorful and sometime caricature-like personalities….lots of musicals have that. That’s not what’s compelling about GENTLEMAN’S GUIDE. 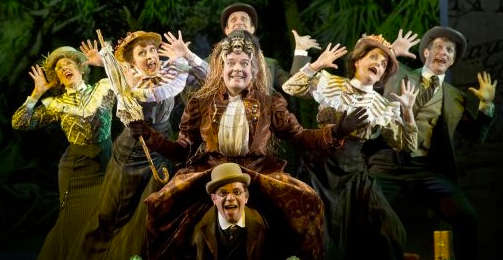 What is unlike any murder-mystery comedy I’ve see is simply: Jefferson Mays (who plays all of the D’Ysquith family members, and offers moments with lightning fast costume changes. Surely, there HAD to be doubling…wasn’t there?) It’s part comedy of errors and part magic show. It’s all wonderful! Mays is a captain of this vessel and his and Pinkham’s timing (with all the quirks that make British aristocrats so much fun to impersonate!) are spot on. There was one time that I laughed out loud (one of those annoying “explosion guffaws” that you absolutely hate when people set free) at a time that no one else laughed…and Pinkham was simply reacting to something. It was so funny though! I couldn’t help it. My apologies to the lady sitting in front of me who I scared. (Which, of course elicited even more laughter which I fought hard to suppress.) It’s one of those types of shows….you find what YOU want to find funny…and there is a whirlwind of “funny” to choose from. The comedy is thoughtfully writing with an old-world Agatha Christie charm and an Importance of Being Earnest flare…it makes you pine to be born in that era so in which you didn’t feel so unsophisticated. I drank tea when I got back to my hotel room. The show cannot be truly defined as a murder MYSTERY, as we see nearly every plot device and subtext nuance drop dead before our eyes. There’s nothing mysterious about it. Yet, we root for the heavy veil of plot (woven in dramatic irony) to drop at the characters feet. And when it does…often as a result of Mays unbelievable changing-in and changing-out of characters….we applaud. (And I applaud those backstage changers as well.) The show is matter-of-fact, tongue-in-cheek, and slap-stick all at the same time…and yet I feel somewhat refined after having watched it. It’s weird. Overall…if you pine to see a killer musical…one with every ingredient that it takes to offer a fun and certainly unique story (with surprises in the ending as well!) then purchase your tickets now. Orchestra…not balcony. The Walter Kerr Theatre has very little leg room in the balcony. My left leg was as dead as Reverend Lord Ezekial D’Ysquith halfway through Act One. This entry was posted on July 7, 2014 at 9:00 pm and is filed under REVIEWS with tags a gentleman's guide to love and murder, andrew lloyd webber, broadway, bryce pinkham, by jeeves, D'ysquith, gentleman's guide, jefferson mays, murder, musical, review, the drowsy chaperone. You can follow any responses to this entry through the RSS 2.0 feed. You can leave a response, or trackback from your own site.